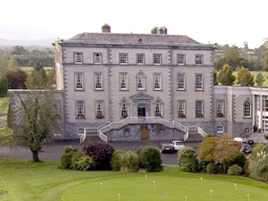 Dundrum House Hotel Golf & Leisure Resort is set amidst 200 beautiful acres and is home to an 18 hole championship golf course with 7,200 yards of challenging play. The Venue Clubhouse offers a great dining experience and has an excellent reputation for food and hospitality. There is an Irish Night held in the Venue every Thursday evening, which is well worth a visit. The Resort also offers golf lodge accommodation which are bright, spacious 2 and 3 bedroom houses. Guests also enjoy an onsite Leisure Club with 20M pool, children’s pool, Jacuzzi, steam room, sauna and gym. The Hotel itself has 62 bedrooms, and is currently closed due to a fire in the kitchen area at the end of September 2015 but due to reopen June 2019. All other areas of the Resort remain open and operational – Golf, Golf Clubhouse Bar & Restaurant and Leisure Club. 6 two-bedroom apartments and 16 two and three bedroom holiday homes. Great onsite leisure facilities, a championship golf course and an truly inviting Clubhouse Bar & Restaurant will enhance your stay in the Heart of Tipperary. You will enjoy complimentary access to our Leisure Club with a 20 metre swimming pool, children’s pool, jacuzzi, sauna, steam room and gymnasium. The Venue Clubhouse Bar & Restaurant is a casual setting where traditional wholesome food is served daily. Guests who wish to test their golfing skills will receive discounted green fees for our much sought after 18 hole championship course, designed by 1995 Ryder Cup hero, Philip Walton.